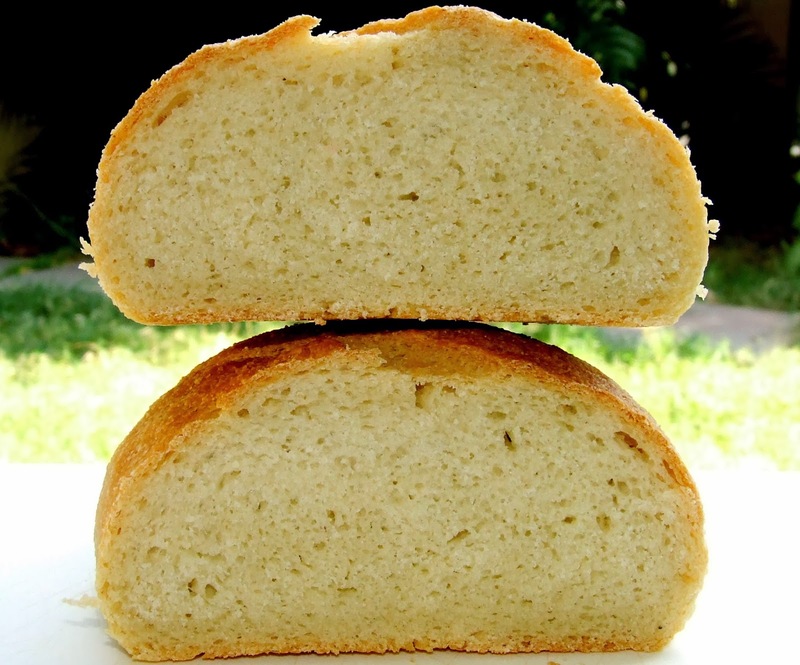 Semolina gives great texture to the bread. 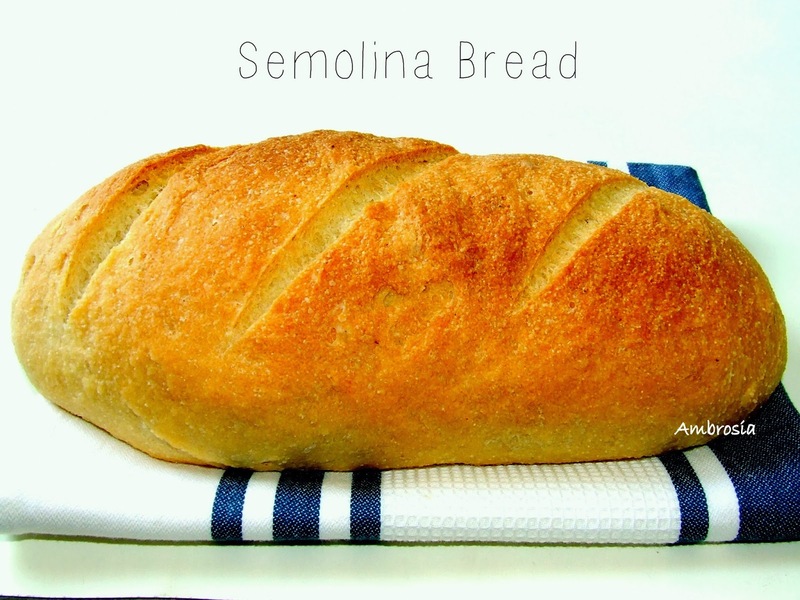 Semolina makes the crumb really soft. 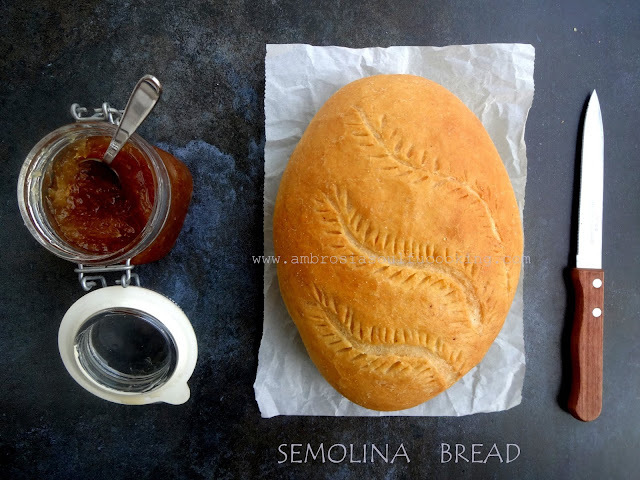 When I first used Semolina to bake bread, I was quite skeptical. I was not too sure if the grainy semolina could be kneaded into the dough with the right softness that is required to get a good loaf. But the result was quite contrary to my expectations. The loaf was perfect, the crumb soft, and the taste – great. This is my second bread with semolina. 1 teaspoon olive oil to grease the bowl, hands and baking sheet. To make the sponge, add yeast to warm water in a mixing bowl. Add all purpose flour and mix well. Cover and keep it in a warm place for 1 hour or till the sponge doubles. To make the dough, whisk semolina with all-purpose flour and salt. Add olive oil and mix well. Stir the sponge and deflate it. Empty it in the kneading plate. Add semolina flour mix. Drizzle some olive oil in your hands and knead for 6 to 8 minutes. The dough feels very wet and sticky in the beginning. Gradually semolina absorbs water and begins to swell. The dough becomes soft, supple and elastic. Transfer the dough to an oiled bowl. Cover and keep it to rise for one hour or until doubled. Turn the risen dough onto the floured counter and deflate it. 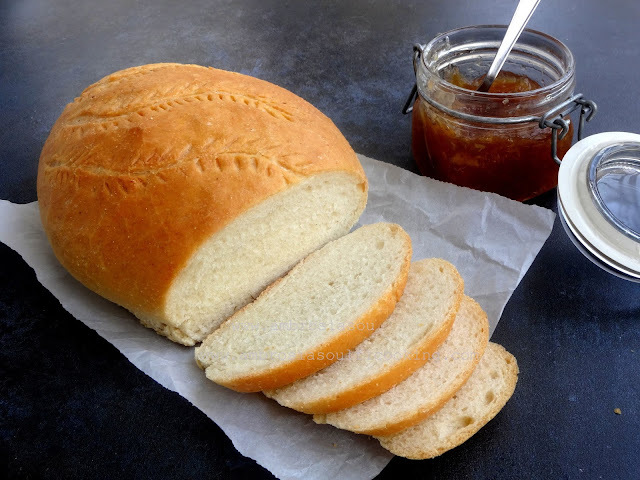 Knead for 2 minutes and shape it into an oval by stretching the surface and tucking it down. Grease the baking tray, sprinkle some wheat flour and place the shaped dough with the tucked side down. Cover with a greased plastic wrap and keep it to rise for 1 hour or until doubled. Take a sharp knife, hold it at about 30-degree angle to the loaf and slash three lines. Bake in a preheated oven at 200 degrees C for 30-35 minutes, until the loaf turns golden brown and sounds hollow when tapped. Cool on a rack, slice next day. Hi Namita... loved the way the bread shaped up in the first picture. Looks straight out of a bakery! Semolina is Rava right? It doesnt give a coarse finish to the bread? Interesting... I would like to try that sometime. Hello Nandita, Yes, Semolina is Rava. Before i baked breads with semolina, I also thought that it would give coarse finish to the breads. But by the end of kneading the dough, semolina becomes smooth and elastic. Bake it to believe it.